Chinese actress, Zhang Ziyi (章子怡) and model, Zhang Zilin (張梓琳) both attended the opening ceremony of Giorgio Armani's new store in Hong Kong, China on March 13, 2013. Zhang Ziyi (章子怡) wore a blue silk fantasy print jacket with a pair of black shorts. T-bar sandals and light accessories to complete her rather casual outfit. 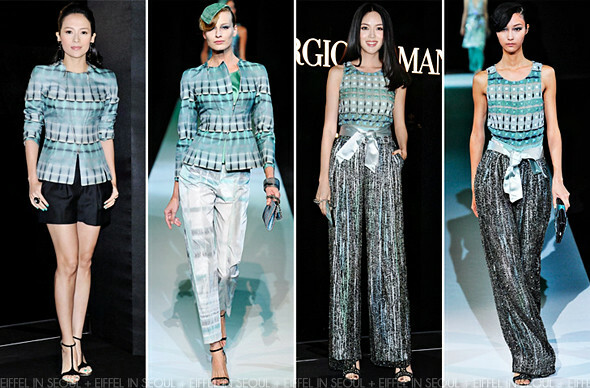 Zhang Zilin (張梓琳) wore a runway look from Giorgio Armani Spring/Summer 2013 collection. Those beautiful trousers looked fantastic on her. However, the length seems odd.